For the Treatment of Tuberculosis in combination with other anti Tuberculosis drugs. Treatment of leprosy and atypical mycobacterial infection. Prevention of meningitis caused by H.influenza in children. In combination with co-trimxazole for the eradication of staphylococcal infections. Along with Vancomycin,ceftriaxone or cefotoxime ,for the treatment of meningitis caused by highly penicillin resistant pneumococci. Rifampicin is a bactericidal drug and inhibits the synthesis of RNA in the bacterium by inhibition of the enzyme referred to as DNA dependent RNA polymerase.It inhibits DNA dependent RNA synthesis.Probably the basis of selective toxicity is that mammalian RNA polymerase doesn’t avidly bind rafampicin.Resistance to Rifampicin could occur due to mutation in the gene of RNA polymerase of the mycobacteria.This will stop the binding of rifampicin with the RNA polymerase of bacterium. Headache, Diarrhea, and abdominal discomfort . If Given in less than twice weekly doses,it can cause flu-like symptoms,such as fever,malaise,muscle pain,thrombocytopenia,neutropenia, anaemia and renal tubular necrosis may occur. Hypersensitivity reactions like skin rashes and fever may occur. Cholestatic jaundice and rarely hepatitis can occur. It can cause your urine and sweat to have an orange or reddish colour but This is completely harmless. Collapse and shock,acute renal failure, respiartory symtoms include shortness of breath. 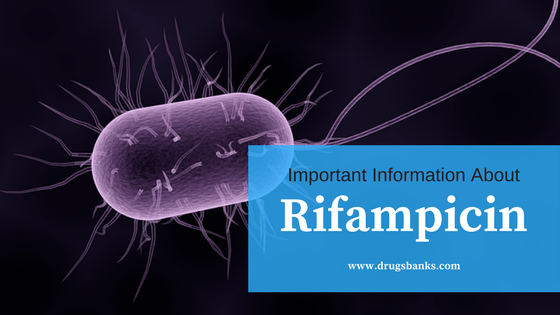 There are very limited knowledge regarding fetal risks following exposure to Rifampicin throughout pregnancy. No exaggerated risks of miscarriage, congenital malformation, preterm delivery or low birth weight are attributed to Rifampicin exposure, though the underlying maternal infections requiring Rifampicin treatment have known independent risks throughout pregnancy.Manufacturer advise very high doses teratogenic in animal studies in first trimester and risk of infant bleeding is also increased in third trimester.While quantity of Rifampicin in breast milk is simply too little to be harmful. Dose For The Treatment of Tuberculosis is 10 mg/kg/day (600 mg daily) twice weekly. 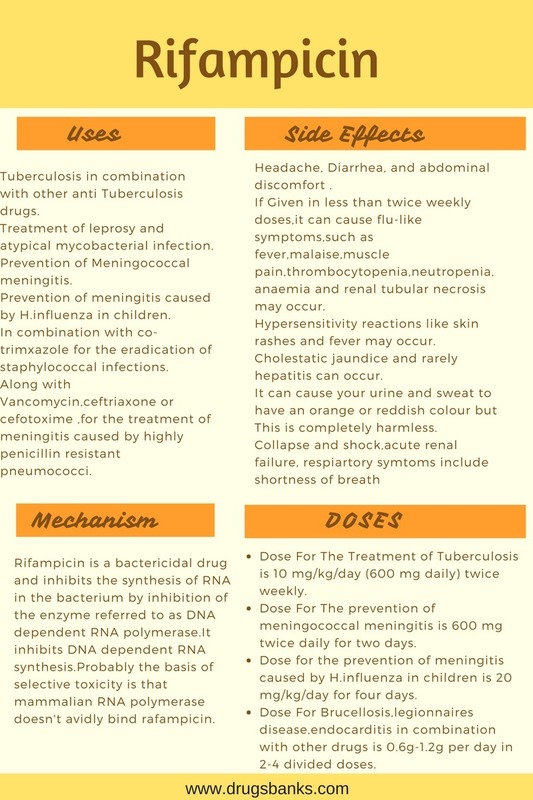 Dose For The prevention of meningococcal meningitis is 600 mg twice daily for two days. Dose for the prevention of meningitis caused by H.influenza in children is 20 mg/kg/day for four days. Dose For Brucellosis,legionnaires disease,endocarditis in combination with other drugs is 0.6g-1.2g per day in 2-4 divided doses.